The perfect proportions of the Buddhas body corresponds to the design of religious monuments. Its architecture developed from the pre-Buddhist Indian grave-mound. Under these mounds the saintly ascetic were buried; their bodies were seated on the ground and covered with earth. These dome-shaped graves, or tumuli, of the saints were regarded as holy places. And were destinations for pilgrimage for the devotional and places of practice for meditators. 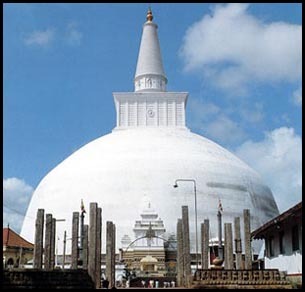 Ruwanweliseya, or the "Great Stupa", is regarded as the most important of the stupas at Anuradhapura, Sri Lanka. Standing at 300 feet, it is the oldest but smallest of the three giant edifices in brick in the world. The stupa, decorated by coral brought from the Mediterranean by an envoy of the Sri Lankan king who had an audience with the Roman Emporer Caesar Augustus, was restored by successive rulers. The stupa built by King Duttugamunu, is surrounded by an elephant wall, a restored design of an earlier expression. This design has been repeated in Thailand, Burma, and other countries where Buddhism was taught by monks from Sri Lanka. 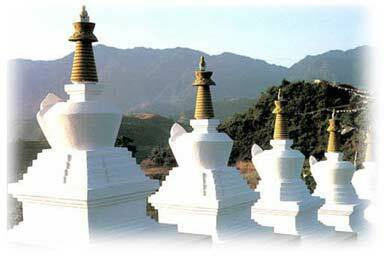 The basic structure of a Chorten consist of a square foundation symbolizing the earth, a dome symbolizing water, and thirteen tapering steps of enlightenment symbolizing the element of fire. These steps lead to a stylized parasol, the symbol of wind, which is topped in the ethereal sphere by the well-known twin-symbol uniting sun and moon, which is the shimmering crown of the Chorten. The Seed of Highest Enlightenment, also depicted as a Tongue of Flame (Bindu) to be realized above the double symbol crowning Chorten. The double symbol (Surya Chandra) of Sun and Rising Moon is an emblem of the Twin-unity of the Absolute Truth (of the sphere beyond normal comprehension) and the Relative Truth (of the worldly sphere). The stylized Parasol (Chattra) symbolically giving protection from all evil. The thirteen Steps of Enlightenment, i.e. the first ten Steps of Enlightenment (Dasha-Bhumi) and the three higher levels of supraconsciousness (Avenika-smrityupashthana). The dome, corresponding to the primeval mound, as Receptacle of Relics or offerings (Dhatu-Garbha); the dome-line edifices of Old Indian Stupas were also called egg or water-bubble (Budbuda). The base (Parishada) is square and four-stepped, its sides facing the four directions. Analogous to the underworld. Copyright © 2008 - BDEA Inc. & BuddhaNet. All rights reserved.